On January 13, 1915, a series of four terrible earthquakes struck central Italy. In seconds, the quakes leveled the city of Avezzano and fifteen other neighboring villages, killing more than 30,000 people. But in the midst of tragedy, the quake also brought forth from the local church’s rubble one of Christendom’s long-lost and precious relics. The earthquakes helped bring awareness to the small cloth that lay over Jesus’ face when he lay in the tomb. Thanks to author Paul Badde, you can learn of the loss and recovery of this beautiful relic. 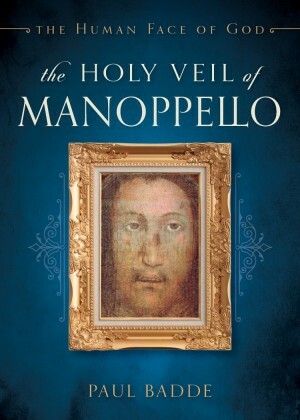 With dozens of color pictures, you can also gaze on the face of Christ himself within the pages of The Holy Veil of Manoppello. Manoppello tradition holds that St. Michael, disguised as a pilgrim, brought the delicate veil to Italin town. Ancient Christian iconography traditionally depicts Michael carrying the veil. Even the column of Veronica at Saint Peter’s gives witness to this tradition, as St. Michael appears on the marble pillar holding the veil. 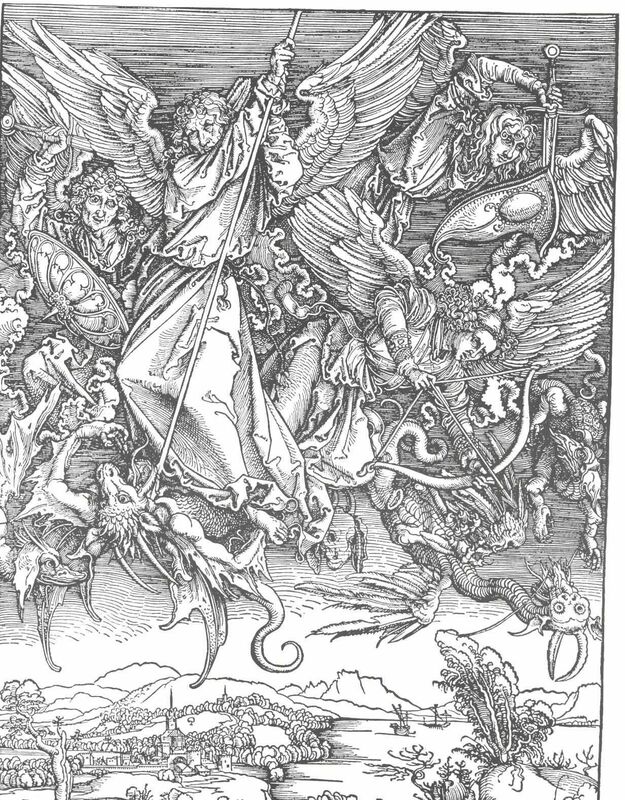 In 1978, Professor Pfeiffer, a world renowned sindonologists was the first to discredit the pious legend of St. Michael’s involvement with the veil. The German professor discovered that the veil was originally meant to be viewed at St. Peter’s basilica in Rome. When Emidio Petracca was ten years old, he was buried in the ruins of the 1915 earthquake in Cese. The earthquake struck while Emidio was serving at daily Mass. After long hours, an unknown rescuer was able to to pull Emidio to safety. When the boy turned seventeen, he entered the Capuchin convent, and took on the religious name Domenico da Cese in memory of Saint Dominic. 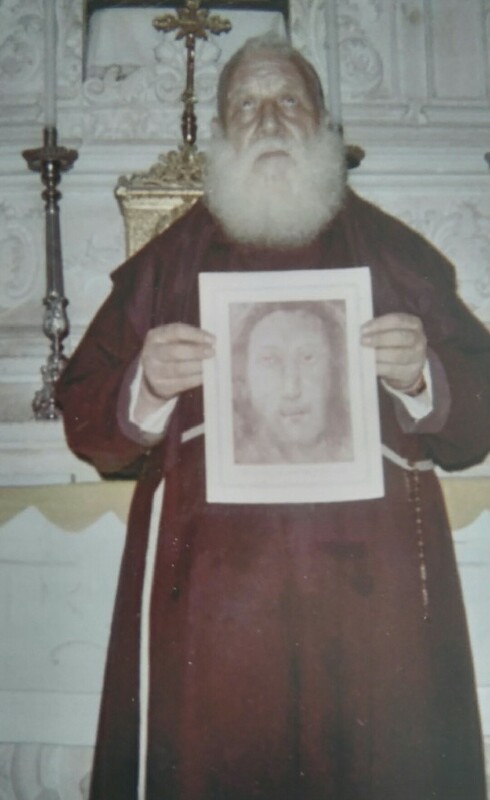 Father Domenico spent the rest of his life studying the veil, and he soon became known as the Apostle of the Holy Face. 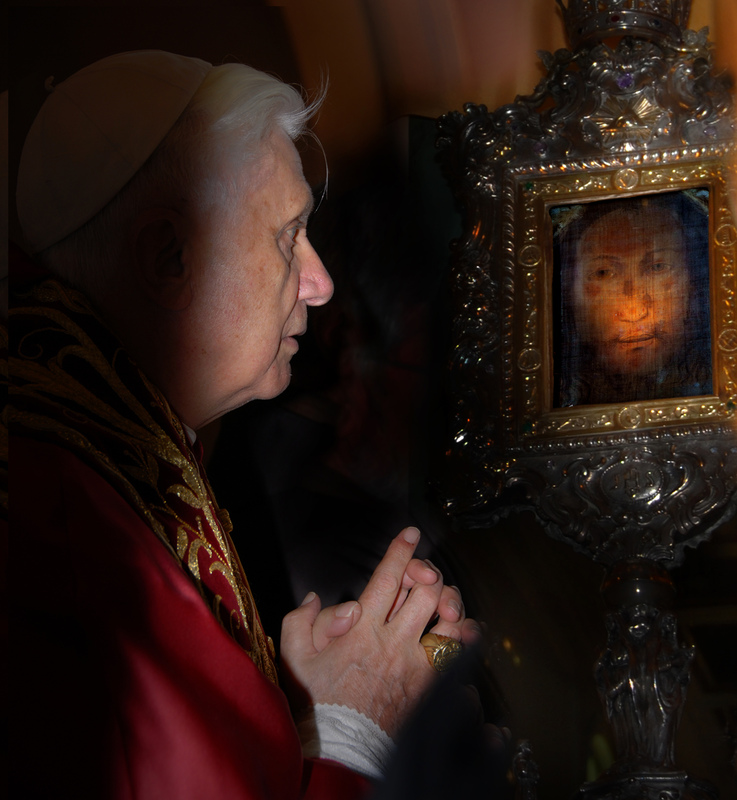 “Even decades later, his brothers recounted having seen him pray day and night in front of the Holy Face,” Badde writes. In the days of Christ, Jewish burials used a large number of cloths. These clothes are kept and venerated not only in Manoppello, but all across Europe. Pieces of the burial cloths can be found at Turin in Piedmont, at Oviedo in Asturias, at Cahors in Occitania, in the treasury of the Lateran Basilica in Rome, in an abbey near Aachen, and in the Mainz on the Rhine. But only two of these burial cloths have images on them – the Shroud of Turin and the veil in Manoppello. The structure of the veil itself was what convinced Pope Benedict XVI to visit. Dorothea Link discovered that the veil was not made of wool or silk, but rather the silky filaments of a fan mussel. Before he was elected pope, Benedict XVI heard of sea silk via a local paper. “Without the term ‘marine byssus’ introduced by Dorothea Link, the pope most probably would have never gone to Manoppello,” Badde explains. You can pick up a copy of The Holy Veil of Manoppello at your local Catholic bookstore. More of an online shopper? Get a copy through Sophia Institute Press.